I just returned from a week in the Colorado mountains with 21 other polymer clay artists. The highlight of the week, for me, was my collaboration with Rebecca Watkins. 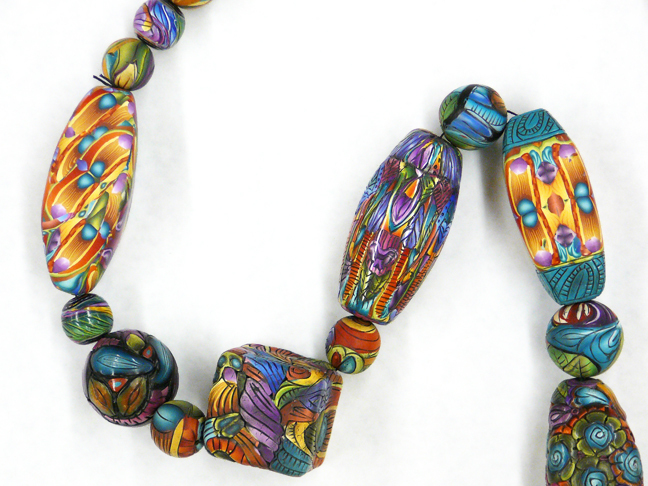 The goal of the collaboration was to complete a necklace of very large beads combining caning and carving techniques. I don’t want to say too much about the collaboration and the techniques in this post because both Rebecca and I will be writing about it in the near future, but I do want to share our excitement about accomplishing our goal. 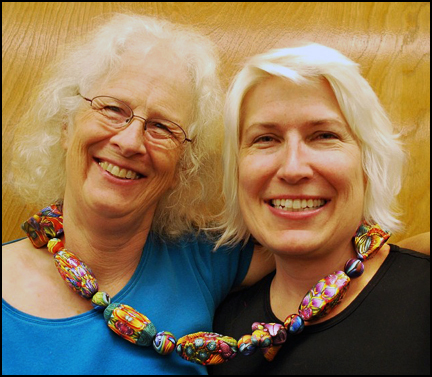 I think it shows in this picture of us wearing our necklace. The collaboration required us to work somewhat outside our comfort zones and as a result we each developed new skills in the process. 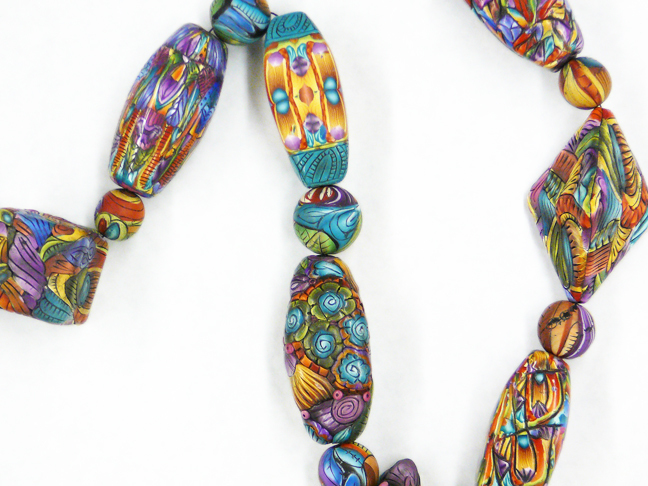 The color in the necklace was created by my canes and the relief was produced using Rebecca’s carving technique. We have returned home now, but we plan to continue our collaboration. Here are some pictures of portions of the necklace. This entry was posted in Caning, Color. Bookmark the permalink. I am working on part of the project now…will have stuff to show soon. I see both of your work all through it. Thank you Jan! We disassembled it and split up the beads. We will continue to collaborate until each of us has a complete necklace. ‘wow! You just keep amazing me. Will you be having a workshop on this technique? This is wonderful work! Will you 2 be teaching this in the future? Rebecca has generously given me permission to teach the technique as she has a full-time job and doesn’t have time to teach. I hope to introduce it in Racine in October, 2014. Nadine, Rebecca has generously given me permission to teach the technique as she has a full-time job and doesn’t have time to teach. I hope to introduce it in Racine in October, 2014. Just saw your template work on PCD. What generous ladies you are to share, even if it is just geometry! You both rock! 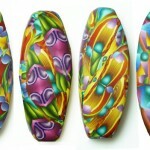 How fun it is to see you on Polymer Clay Daily! You are always so curious and willing to try new things. I love your idea for Hollow beads. How clever is that, and yet so simple. Duh, why didn’t I think of that. Wish I had listened more in geometry class instead of watching the boys. Great idea the finish beads is fantastic the texture the colors the shapes . Amazing work and good understanding each other.